As soon as late 2019, another airlock is expected to be delivered to the International Space Station, but it won’t be used for astronauts or cosmonauts. Instead NanoRack’s Bishop airlock module will be utilized to deploy CubeSats and other external payloads for NASA and governmental or commercial customers. 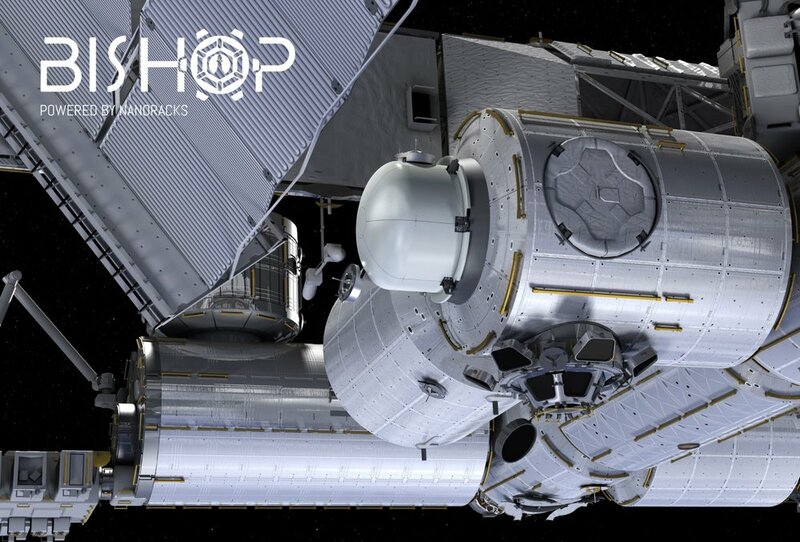 This commercially-funded airlock is being built by Boeing and Thales Alenia Space on behalf of NanoRacks, which is a private company that provides hardware and services for other companies and organizations to do business in space, including at the ISS. NanoRacks already offers a number of options for utilizing the ISS, including CubeSat deployment opportunities, an external platform and several internal facilities to support microgravity research. Bishop, however, is NanoRack’s answer to the ever-increasing demand to deploy small satellites and payloads from the ISS. Currently CubeSats sent to the space station via robotic resupply spacecraft can be deployed via the Japanese Kibo module equipment airlock and from external deployers developed by the company. Additionally, some cargo ships have external deployers that launch small satellites directly from the autonomous freighters after their primary logistics mission is completed. For the Kibo airlock, however, its use is limited (only about 10 openings a year) and its size is small—the maximum size of an object that can be placed in the airlock is about 57.6 by 83.0 by 80.0 centimeters, according to the Japan Aerospace Exploration Agency. According to NanoRacks, Bishop offers five times the satellite deployment volume than other options on the ISS, nearly 4 cubic meters, and is expected to be used 4-8 times per year. Not only can larger objects and more CubeSats be moved to the outside of the station, larger items can be brought inside as well. Additionally, the airlock can double as an external experiment platform and be attached to the Mobile Base System. Moreover, at the end the useful life of the ISS, the airlock can be moved to another orbital platform, such as its Independence-1 concept station. As of May 2018, the airlock has completed its critical design review and is now moving into fabrication. Thales Alenia Space is building the pressure shell as well as other secondary structures, like micrometeoroid shielding, insulation panels and other structural components. Boeing is building the passive common berthing mechanism that will connect it to the port side of the Tranquility module. Shipment of parts to NanoRacks in Houston is expected in 2019. The company is then expected to integrate the avionics and wiring to complete the assembly. Bishop is expected to launch in the trunk of SpaceX’s CRS-19 Dragon mission in late 2019 at the earliest.